Work with designer Stephanie to create your own unique wedding dress. Each dress is bespoke and made to realise your dream using her vintage-inspired design principles and technical expertise together with your own inspiration. Please note that this is not a service to copy another designer's work. Stephanie can suggest a silhouette based on something that she has produced in the past or something unique to you. In both cases, she will take into account your vision and personal style. Magazine tears, fabric cuttings and shared Pinterest boards are all welcome! You will be guided on a shape and style to suit your body and complexion, as well as your wider wedding look. For a complimentary consultation please get in touch! 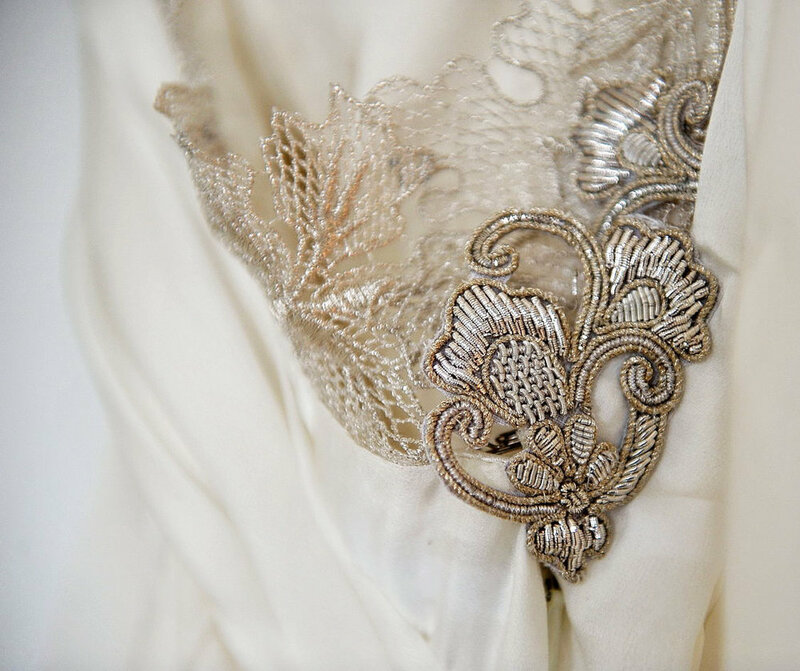 A suitable selection of fine silks and laces will be presented to each bride, as well as the option to source original vintage embellishments or to have a bespoke decoration created. A toile (prototype) will be made up based on your measurements and in accordance with the design created for you. This will become a working garment, altered to fit your body perfectly. Final features will be decided upon during the toile process as the design blossoms into 3D. The number of fittings depends on the complexity of the design and the handle of the fabric. Suitable underwear will be recommended according to the style of the dress. It is important that you bring your chosen underwear with you to fittings as a perfect fit cannot be guaranteed without this. Your fabulous heels will be required for the final fitting when the hem of your dress will be cut and finished. Most dresses require 2 to 3 fittings but if your design is particularly complex or your body shape changes dramatically during the process, more may be needed. An initial non-refundable deposit of 50% is requested at the time of booking your dress. A further 25% will be due when your dress is ready to be made in final fabrics and the final balance is payable when your dress is ready for collection. A 6-12 month lead time is recommended, however shorter schedules can usually be accommodated. Your dress is ready for collection 2 weeks prior to your wedding date unless otherwise requested at the time of booking. This allows the best fit opportunity as many brides change weight close to their wedding date. It also removes the difficulty of keeping the dress away from prying eyes! Prices vary depending on the style and complexity of the design. Please enquire for details.